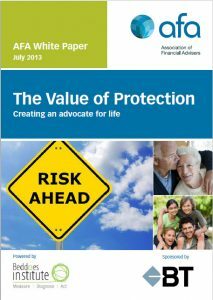 The “Value of Protection – Creating an advocate for life” white paper provides new guidelines for optimising claims outcomes for both consumers and insurers and raising the standard of claims management in Australia. It focuses on consumers’ perceptions of the life insurance industry with regard to Income Protection insurance and the expected experience when lodging a claim. These perceptions have then been road-tested against actual claims experiences of consumers who received early engagement and enhanced support from their insurer. Analysis of the perception-experience gap highlights the benefits for insurers and consumers of adopting a holistic and consumer-centric approach to claims management. Finally, a needs analysis has confirmed the seven critical needs that consumers have along the claims journey. These needs provide insurers and advisers with a consumer-focused ‘best practice’ framework that can be used to evaluate current claims management approaches and develop new and improved models of service into the future.